March 15, Feast of Saint Longinus. Before the Cross II: The Centurion, 1. Orthodox and Roman Catholic tradition names the centurion Longinus, supposing that it was he who drove the lance into Jesus’s side. A number of traditions grew up around him in the early church, among them that he was martyred. As a saint, he is now remembered by Roman Catholics on the 16th. October, though his original feast day was the 15th. March (still kept in the Extraordinary form). He appears in Luke and Mark’s gospels confessing by himself, and in Matthew, confessing together with the other guards. The spearman in John’s gospel is only identified as “one of the soldiers”; we cannot know if this was the centurion himself or one of the soldiers under his command. Nevertheless, responsibility for ensuring that all three crucifixion victims had died would have rested with him. 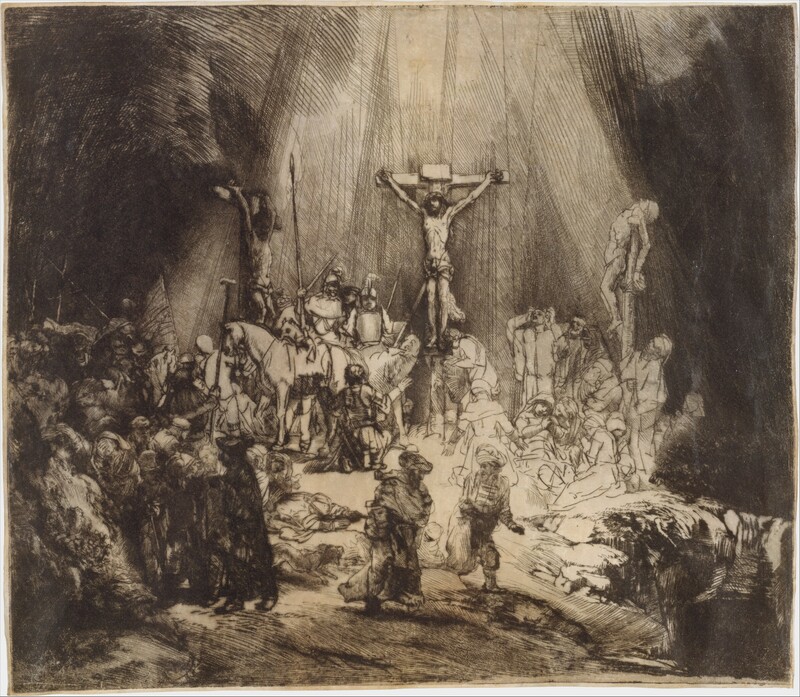 In this print, Rembrandt depicts the moment of Jesus’s death, after three hours of unnatural darkness. The eye is drawn towards Christ on the cross, but the crowded scene is one of contrasting human responses to revelation. Some run away, others stand in awe. Mary has fainted, overwhelmed by grief. Mounted Roman soldiers continue, unmoved, in their menace, but the centurion kneels at the foot of the cross to declare “Surely this was a righteous man”. Though Luke doesn’t record that the centurion heard the exchange between Jesus and the two thieves, it seems likely that he would have made it his business to listen. We cannot know at what point during that day he recognised the uniqueness of Jesus among all the men he had executed, from the trial where Pilate declares him to be innocent, up to the time of his death. But I imagine that Jesus’s extraordinary compassion towards an anguished soul (while in the midst of his own suffering) compounds with all the other questions that Jesus had raised in the centurion’s mind that morning – and with this strange darkness – to persuade him, not only of the injustice in which he has played such an active role, but also of its massive cosmic significance. The penitent thief (a Jew) and the confessing centurion (a gentile) both recognised the truth, and indeed the understatement, of the words on Pilate’s sign intended to mock Jesus: “King of the Jews”. The true King welcomed them, one at the point of physical death, and the other in a radically restored life, purpose and hope. The one, cursed and shamed by the world for crimes he acknowledged, yet received by Jesus; the other, an enforcer of Roman law and follower of the imperial cult, moved and shaken by his involvement in an act of barbaric injustice, now knowing that he was in the presence of the true “Son of God”. And so he also welcomes us, whatever our past, and whatever our blindness has been towards him. He welcomes us to participate in a kingdom on earth that has not grown out of human competition or military might. He welcomes us to the very presence of the living God. Rupert Greville is a member of the L’Arche Kent Community. Before Amsterdam had numbers for houses, people used plaques on their walls to identify their home or business premises. Perhaps this one belonged to one of the many exiles living in what was then a small city on a marshy riverside. Here is Joseph taking a watchful Mary and Baby away to Egypt; He has his tools with him, including one very long saw. Perhaps he cut his own planks from the tree, or maybe it pleased the artist’s eye to show it at the pinnacle of the picture. Joseph may have given up his business but he was not giving up work. Here is a prayer from USPG. O God, who made your home among us in Jesus of Nazareth, we pray for those who have been forced from their homes and now live as migrants and refugees. Bless them and all who work to bring them relief, comfort and a new home. We could pray, too, that refugees may be allowed to find work and education in their exile, that they may be better equipped to help restore their homeland when they are able to return. Wishing all our followers, friends and readers, regular or occasional, a blessed Christmas, and a New Year where Peace prevails. We remember that many are forced to be away from home, or without loved ones, especially for the first time, or facing illness or poverty; and pray that the Peace that surpasses understanding will find its way into their hearts. The Flight into Egypt from a plaque at Amsterdam’s City Museum. October 10, Traherne XI: His desire is yours. O the nobility of Divine Friendship ! Are not all His treasures yours, and yours His? Is not your very Soul and Body His : is not His life and felicity yours : is not His desire yours? Is not His will yours? And if His will be yours, the accomplishment of it is yours, and the end of all is your perfection. You are infinitely rich as He is : being pleased in everything as He is. And if His will be yours, yours is His. For you will what He willeth, which is to be truly wise and good and holy. And when you delight in the same reasons that moved Him to will, you will know it. Though perhaps you will know that delight without having the words to express it in Christian language as Thomas Traherne does here. Laudato Si! 23 September: Jesus in the Attic II, Persecution leads to Amsterdam. I recently came across a long poem called ‘Our Blessed Lady’s Lullaby’ and then found out about its writer. My research led me to Our Dear Lord in the Attic, an attic in Amsterdam, where we visited him. Here is one verse from the poem: Mary is speaking. My Son doth make to shine. Richard Rowlands alias Verstegen wrote this hymn around 1600. He was an English Catholic who fled to Amsterdam after escaping from imprisonment for his faith at home. He made a new and prosperous life in Amsterdam, a Protestant city. All the Catholic churches there were closed down, including the big church at the Beguinage Convent, now a Scottish Presbyterian church. The good beguine ladies there simply carried on after moving their place of worship to ground floor rooms in their main building. I do not know where Rowlands worshipped, but a little after his time people met for Mass at another city centre site, now known as Our Dear Lord in the Attic. its presence was an open secret; the people of Amsterdam were not given to executions for those who worshipped differently to the official norm. The Attic Church remained open till the mid nineteenth Century when a new Catholic church was erected nearby. It is now a museum, with the Church area all ready for the occasional worship that takes place there. This statue of the Madonna and Child belongs here. We will return to Our Dear Lord in the Attic. There are many links to the poem on the web, some set to music. 27 June: Water: in their element. This blog is not meant to be the holiday snaps of any of the contributors, but these fit well with this week’s feast of John the Baptist. And contrast them with the rather solemn fountain at Saint Peter’s in Rome that illustrated the Infallibility posts from Friar Austin! The tulips give the location away: this surprising fountain is in Amsterdam and was enjoyed by young and old. Especially young? I hope their phones were waterproof. The waters of Baptism, of course, are free for anyone to request and receive. And they give freedom to have fun for Eternity! Religion need not be buttoned up and strait-laced, enjoy being fully alive! If you can’t find a fountain, find a friendly puddle, Splash, splash, splash, as Abel would say! June 19: You have to help me! There’s a lesson there which I won’t spell out! It’s a good headline isn’t it! Poor Saint Valentine gets supplanted by Ash Wednesday this year. Let’s remember him in advance! One day last October we were out foraging for sloes, those sharp, purple little wild plums, the fruit of the blackthorn, one of the earliest spring flowers. Something reminded Janet of this passage in the old ‘Dutch Catechism’ which was part of her journey into the Church. Appropriate reading for Saint Valentine. People begin to suspect that they are meant for each other when they experience the marvel of falling in love. A young man and a young woman discover something in each other that no outsider can fully see. The hope and the need of giving themselves to each other completely take over and grow and grow. The heart has its reasons which the reason does not quite know, according to Pascal, nor is it necessary that it should. But if one is to give oneself to another totally and for ever, one must make a decision with one’s whole person. Hence reason and conscience cannot be left out. The enchantment of love opens the eyes to the uniqueness of the other, but it can also be blind if it remains a superficially sensual or romantic attachment. And that headline was on the bookmark Janet was using all those years ago. 17 September: Dialogue, Missionary Style. I was with a Missionary of Africa, fifty years a priest, mostly in Northern Ghana, where both faiths live side-by-side. ‘Always, if I wanted to do something, I would go to the mosque and I would talk to the Imam, and be seen talking to the Imam. Do nothing without telling him, then he knows you are not trying to undermine him or his people. Always, always Muslims are included, try to do nothing separately, be sure that the whole community can benefit. ‘Do not confine your work only to the poorest. You could be seen as undermining the better-off, especially if some of them are Muslim and see the poor Christians or traditional believers being helped, becoming organised, as a threat. Always be open. April 20: Jerusalem IV: Beware: Angels! Of course there was trouble since this event took place on a Sabbath day, and the great and the good were concerned to keep the Sabbath holy. But they failed to see the bigger picture. Would they have regarded a woman giving birth on a Sabbath day, as unavoidable but regrettable? Surely not, but here is another new life before their very eyes, and they miss-see it. The Missionaries of Africa (White Fathers) now live at the site of Bethesda, at the Church of St Anne, mother of Mary, grandmother of Jesus. It is a place of study and reconciliation between denominations, faiths and races, a place of welcome. Jesus took on the role of the healing Angel at the Pool of Bethesda; the Missionaries of Africa hope to contribute to healing a broken world. Like Melchizedek they are messengers of the Lord, Angels in human form: please pray for them.